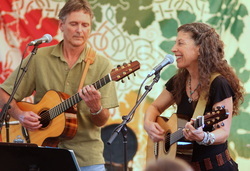 Monterey Bay-based and long-time favorites in the San Francisco Bay area, Alisa and Kimball have earned national acclaim for their songwriting and world music repertoire. Known for her “deep, emotional singing voice,” Alisa’s background in sacred music adds a compelling world music component to this duo’s lush repertoire. She is perfectly complemented by multi-instrumentalist and singer/songwriter Kimball Hurd, best known for his role in the California trio City Folk. Hurd, a Bammie (Bay Area Music Association) award winner, offers songs from his own catalog of powerful originals. His versatility on guitar, mandolin, mandola, slide guitar and banjo adds exquisite musical textures to their gorgeous harmonies.